This article is about the television series. For the series of novels, see The Expanse (novel series). The Expanse is an American science fiction television series developed by Mark Fergus and Hawk Ostby, based on The Expanse novels by James S. A. Corey. The series is set in a future where humanity has colonized the Solar System and follows a disparate band of antiheroes – United Nations Security Councilwoman Chrisjen Avasarala (Shohreh Aghdashloo), police detective Josephus Miller (Thomas Jane), ship's officer James Holden (Steven Strait) and his crew – as they unwittingly unravel and place themselves at the center of a conspiracy which threatens the system's fragile state of Cold War-like peace, the class balance, and the survival of humanity. Critics have praised the show for its visuals, character development and political narrative. It received a Hugo Award for Best Dramatic Presentation and three Saturn Award nominations for Best Science Fiction Television Series. Alcon Entertainment produces and finances the series. It sold three seasons to Syfy, which canceled the series in May 2018; Amazon Prime Video picked up a fourth season later that month. Hundreds of years in the future, in a colonized Solar System, police detective Josephus Miller (Thomas Jane), born on Ceres in the asteroid belt, is sent to find a missing young woman, Juliette "Julie" Andromeda Mao (Florence Faivre). James Holden (Steven Strait), Executive Officer of the ice hauler Canterbury, is involved in a tragic incident that threatens to destabilize the uneasy peace between Earth, Mars and the Belt. On Earth, Chrisjen Avasarala (Shohreh Aghdashloo), a United Nations executive, works to prevent war between Earth and Mars by any means necessary. Soon, the three find out that the missing woman and the ice hauler's fate are part of a conspiracy that threatens humanity. The Expanse is based on the novel series of the same name by James S. A. Corey, a pen name of the authors Daniel Abraham and Ty Franck, who also serve as writers and producers for the show. The first novel, Leviathan Wakes (2011), was nominated for the Hugo Award for Best Novel and Locus Award for Best Science Fiction Novel. On April 11, 2014, Syfy announced a straight-to-series commitment to a television adaptation of the book series, and ordered the production of 10 one-hour-long episodes for the first season. On that date Syfy President Dave Howe commented: "The Expanse is epic in scale and scope and promises to be Syfy's most ambitious series to date". Mark Fergus and Hawk Ostby wrote the pilot, directed by Terry McDonough, and serve as writers and showrunners alongside Naren Shankar. Produced by Alcon Television and The Sean Daniel Company, principal photography started on October 29, 2014, in Toronto. The pilot episode was screened at San Diego Comic-Con in July 2015. In May 2015, before the first season aired, writing commenced for a second season, which was ordered in December 2015. The second season of The Expanse premiered on February 1, 2017. On March 16, 2017, The Expanse was renewed by Syfy for a 13-episode third season to air in 2018. Filming for season 3 began on July 12, 2017. Four digital comics based on the books and tying into the television series have been published by ComiXology. The first focuses on the origin of James Holden and was released February 1, 2017. The next three, highlighting the origins of other characters are: Naomi Nagata, released April 19, 2017; Alex Kamal, released May 24, 2017; and Amos Burton, released July 12, 2017. The show's title sequence was animated and directed by Australian studio Breeder and its VFX team. On May 11, 2018, Syfy did not purchase the rights for future seasons because of restrictive distribution arrangements, and announced it was cancelled. Alcon looked for other channels to distribute future seasons. Fans protested the cancellation, gathering over 100,000 signatures for an online petition. They lobbied Amazon Studios and Netflix to pick the series up; a crowdfunding campaign paid for an airplane to fly a "#SaveTheExpanse" banner around Amazon Studios. Celebrities including Wil Wheaton, George R. R. Martin, Patton Oswalt and Andreas Mogensen supported the campaign. On May 26, at the International Space Development Conference, Jeff Bezos announced that Amazon picked the series up for additional seasons. Production on the fourth season began in October 2018. The show's soundtrack was composed by Clinton Shorter. The first season's soundtrack dubbed The Expanse Season 1 – The Original Television Soundtrack, consisting of nineteen tracks, was released by Lakeshore Records, on May 20, 2016 via iTunes, and on May 26, 2016 via Amazon. In the United States, seasons 1 to 3 of The Expanse were broadcast by Syfy and streamed on Prime Video. In Canada, these seasons aired on Space and streamed on Crave. In New Zealand, these seasons aired on Sky. In all other countries where Netflix is available, seasons 1 and 2 were streamed until September 30, 2018. On February 8, 2019, Prime Video took over exclusive distribution of the first three seasons worldwide in preparation for its premiere of the fourth season later in the year. The first season received a rating of 65 out of 100 on Metacritic based on reviews from 23 critics, indicating "generally favorable reviews". On Rotten Tomatoes, the season has a score of 77% with an average rating of 7.12 out of 10 based on 43 reviews, as of February 2019. The site's consensus states: "The Expanse blends sci-fi elements and detective noir into a visually compelling whole, though it takes a few episodes for the story to capture viewers' intrigue." Reporting on the pilot screening, io9's Lauren Davis declared herself "blown away" by The Expanse, appreciating its "incredible sense of scale" and its "deeply thought out future world that reflects on our present one, with high production values and characters who speak and act like real people". Max Nicholson of IGN characterized the pilot as "grim and dramatic", and a "very dense hour of television", with the terminology and large cast sometimes difficult to follow for viewers unfamiliar with the novels, but highlighted the pilot's "gorgeous" visuals and effects reminiscent of Battlestar Galactica, Dune and Firefly. Writing for Variety, Maureen Ryan was unimpressed by the first four episodes "awkwardly linking a series of somewhat muddled stories" and the series' stereotypical characters, but credited it with tackling "issues of class, representation and exploitation", and a convincing design. At Tor.com, Justin Landon highlighted The Expanse's "bold and unique cinematography" and its claustrophobic, discomforting set designs, as well as the "extremely faithful" characterization, but remarked that the patois spoken by the Belters, the natives of the asteroid belt, made the series difficult to follow. On Metacritic, it has a score of 77 out of 100 based on 5 reviews. On Rotten Tomatoes, the season had a score of 95% with an average rating of 8.83 out of 10 based on 20 reviews, as of February 2019. The site's critical consensus reads, "The Expanse's second season offers more of the show's excellent signature production values while increasing character development and politically thrilling narratives." Writing for io9, Katherine Trendacosta noted how the show had become "shockingly prescient", insofar as many of the issues and ideas explored by The Expanse mirrored contemporary trends in global politics. Brian Tallerico, in "Why The Expanse Is the Best Sci-FI TV Show You're Not Watching" for Rolling Stone, praised the show for its contemporary political relevance and called its willingness to mix tones, and its protagonists, laudable. He summarized that at its core, The Expanse was all about people responding to fear – fear of the other, fear of the new, fear of inequality, fear of death. 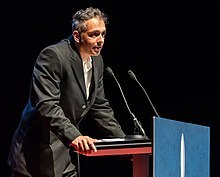 Writing for NPR, astrophysicist Adam Frank praised the show and its writers for the scientific realism. He wrote that "more than any other TV space-themed show, it gets the science right". On Rotten Tomatoes, the season had a score of 100% with an average rating of 8.75 out of 10 based on 22 reviews, as of February 2019. The site's critical consensus reads, "Building on earlier potential and extending character arcs throughout a solidly crafted third season, The Expanse continues to impress – and shows no signs of abating." ^ Noonan, Kevin (September 8, 2014). "Legendary Nabs International Rights to Syfy's 'The Expanse'". Variety. Retrieved March 5, 2019. ^ a b c Weinstein, Shelli (August 21, 2014). "Steven Strait, Shohreh Aghdashloo to Star in Syfy's 'The Expanse'". Variety. Retrieved January 5, 2015. ^ a b c d e Petski, Denise (October 29, 2014). "Dominique Tipper, Wes Chatham, More, Round Out 'The Expanse'". Deadline Hollywood. Retrieved January 5, 2015. ^ a b c Noonan, Kevin (November 20, 2014). "Syfy's 'The Expanse' Adds 'Walking Dead,' 'Mad Men' Alums". Variety. Retrieved January 5, 2015. ^ Petski, Denise (April 14, 2016). "'The Expanse' Casts Frankie Adams As Bobbie Draper". Deadline Hollywood. Retrieved August 4, 2016. ^ Ross, Dalton (July 22, 2017). "The Expanse casts Lost star Elizabeth Mitchell in key role". Entertainment Weekly. Retrieved December 20, 2017. ^ Petski, Denise (July 14, 2017). "'The Expanse': David Strathairn Cast In Key Role In Syfy Space Drama Series". Deadline Hollywood. Retrieved December 20, 2017. ^ Ahr, Michael (February 8, 2019). "The Expanse Season 4 Release Date, Cast, and Other News". Den of Geek. Retrieved February 11, 2019. ^ Nguyen, Hanh (July 20, 2018). "'The Expanse' Boss Explains How Season 4 Will Be Better Now That It's on Amazon". IndieWire. Retrieved January 15, 2019. ^ Kondolojy, Amanda (April 11, 2014). "Syfy Gives Straight-to-Series Greenlight to 'The Expanse'". TV by the Numbers. Retrieved October 30, 2014. ^ a b Bibel, Sara (October 29, 2014). "Syfy and Alcon TV Announce Start of Production on The Expanse, New 10-episode Epic Space Drama". TV by the Numbers. Archived from the original on October 31, 2014. Retrieved October 30, 2014. ^ Andreeva, Nellie (December 31, 2015). "'The Expanse' Renewed For Season 2 By Syfy". Deadline Hollywood. Retrieved December 31, 2015. ^ Moore, Trent (December 31, 2015). "Space opera The Expanse officially picked up for second season at Syfy". Blastr. Retrieved December 31, 2015. ^ @ExpanseSyfy (December 1, 2016). "#TheExpanse Season 2 premiere has moved to 2.1.17. Happy now, Earthers?" (Tweet) – via Twitter. ^ Gelman, Vlada (March 16, 2017). "The Expanse Renewed for Season 3". TVLine. Retrieved March 16, 2017. ^ Eisner, Breck (July 12, 2017). "A small tradition for me is to raise a flag over the set on first shoot day. Today was day 1 of season 3 #TheExpanse". Twitter. Retrieved August 29, 2017. ^ "What's Shooting?". ACTRA Toronto. Retrieved August 29, 2017. ^ "The Expanse Origins #1 (of 4)". ComiXology. Retrieved March 24, 2017. ^ "Breeder Opens "The Expanse" for SyFy". Stash Magazine. December 17, 2015. Retrieved April 3, 2017. ^ Andreeva, Nellie (May 11, 2018). "'The Expanse' To End On Syfy With Season 3, Will Be Shopped Elsewhere By Alcon". Deadline Hollywood. Retrieved May 11, 2018. ^ Ahr, Michael (May 11, 2018). "The Expanse Canceled, Season 4 To Be Shopped Around". Den of Geek. Retrieved May 11, 2018. ^ Kelly, Autumn Noel (May 18, 2018). "'The Expanse' is So Good, Fans Flew a #SaveTheExpanse Plane Over Amazon Studios After SyFy Cancellation". Newsweek. Retrieved May 19, 2018. ^ Shepherd, Jack (May 18, 2018). "George RR Martin and Will Wheaton plead for Amazon and Netflix to renew cult scifi The Expanse". The Independent. Retrieved May 19, 2018. ^ Andreeva, Nellie (May 25, 2018). "'The Expanse': Amazon Picks Up Space Drama Series After Syfy Cancellation". Deadline. Retrieved May 26, 2018. ^ Bui, Hoai-Tran (October 8, 2018). "'The Expanse' Season 4 First Look: Behind the Scenes of the Saved Sci-Fi Show". /Film. Retrieved January 17, 2019. ^ a b "The Expanse – Season 1 (Original Television Soundtrack) – Clinton Shorter". iTunes. May 20, 2016. Retrieved April 3, 2017. ^ a b "The Expanse – Season 1 (Original Television Soundtrack) – Clinton Shorter". Amazon. May 26, 2016. Retrieved April 3, 2017. ^ Trendacosta, Katharine (December 21, 2016). "Someone Is Finally Streaming The Expanse, the Best Scifi Show of the Year". io9. Retrieved January 29, 2017. ^ "The Expanse Is Coming To Space, And Here's Why You Should Be Excited". Space. August 27, 2015. Retrieved November 11, 2016. ^ "The Intergalactic War Continues on Season 2 of Hit Space Series THE EXPANSE, Premiering February 1". Bell Media. January 24, 2017. Retrieved March 5, 2017. ^ "The Expanse is the new sci-fi show you're about to binge on". New Zealand Herald. March 3, 2016. Retrieved November 11, 2016. ^ Petski, Denise (October 11, 2016). "Space Drama 'The Expanse' Acquired By Netflix For Global Distribution". Deadline Hollywood. Retrieved November 11, 2016. ^ Spangler, Todd (January 22, 2019). "Amazon Launching 'The Expanse' Seasons 1–3 Worldwide Ahead of Season 4 Premiere". Variety. Retrieved January 29, 2019. ^ "The Expanse: Season 1". Metacritic. CBS Interactive. Retrieved April 3, 2017. ^ "The Expanse: Season 1". Rotten Tomatoes. Fandango Media. Retrieved February 11, 2019. ^ Davis, Lauren (July 11, 2015). "The Expanse Is the Show We've Been Wanting Since Battlestar Galactica". i09. Retrieved July 12, 2015. ^ Nicholson, Max (July 11, 2015). "Comic-Con 2015: Syfy Debuts Thomas Jane's New Series The Expanse". IGN. Retrieved July 12, 2015. ^ Ryan, Maureen (November 23, 2015). "TV Review: 'The Expanse'". Variety. Retrieved November 23, 2015. ^ Landon, Justin (November 11, 2015). "A Risky Adaptation: Syfy's The Expanse". Tor.com. Retrieved November 23, 2015. ^ "The Expanse: Season 2". Metacritic. CBS Interactive. Retrieved April 3, 2017. ^ "The Expanse: Season 2". Rotten Tomatoes. Fandango Media. Retrieved February 11, 2019. ^ Trendacosta, Katharine (February 1, 2017). "The Expanse Is Back, and It's Become Disturbingly Prescient". io9. Retrieved March 22, 2017. ^ Tallerico, Brian (March 30, 2017). "Why 'The Expanse' Is the Best Sci-FI TV Show You're Not Watching – How Syfy's series about Martian colonies, missing-person cases and interstellar class warfare is slowly turning into a must-see gem". Rolling Stone. Retrieved April 3, 2017. ^ Frank, Adam (March 28, 2017). "Sci-Fi Show 'The Expanse' Preps Us For The Future". NPR. Retrieved April 3, 2017. ^ "The Expanse: Season 3". Rotten Tomatoes. Fandango Media. Retrieved February 11, 2019. ^ Porter, Rick (December 15, 2015). "Monday cable ratings: 'The Expanse' premiere not that expansive, 'Monday Night Football' leads". TV by the Numbers. Retrieved December 15, 2015. ^ Metcalf, Mitch (February 3, 2016). "Showbuzzdaily's Top 150 Tuesday Cable Originals & Network Finals: 2.2.2016". Showbuzz Daily. Retrieved February 3, 2016. ^ a b "The Expanse: Season One Ratings". TV Series Finale. February 3, 2016. Retrieved April 13, 2018. ^ Metcalf, Mitch (February 2, 2017). "Updated: Showbuzzdaily's Top 150 Wednesday Cable Originals & Network Finals: 2.1.2017". Showbuzz Daily. Retrieved February 2, 2017. ^ Metcalf, Mitch (April 20, 2017). "Updated: Showbuzzdaily's Top 150 Wednesday Cable Originals & Network Finals: 4.19.2017". Showbuzz Daily. Retrieved April 20, 2017. ^ a b "The Expanse: Season Two Ratings". TV Series Finale. April 20, 2017. Retrieved April 13, 2018. ^ Metcalf, Mitch (April 12, 2018). "Updated: ShowBuzzDaily's Top 150 Wednesday Cable Originals & Network Finals: 4.11.2018". Showbuzz Daily. Retrieved April 12, 2018. ^ a b "The Expanse: Season Three Ratings". TV Series Finale. June 28, 2018. Retrieved June 28, 2018. ^ "The 2016 DGC Awards Winners and Nominees". Directors Guild of Canada. October 22, 2016. Retrieved July 23, 2018. ^ "The 42nd Annual Saturn Awards nominations are announced for 2016!". Saturn Awards. February 24, 2016. Retrieved July 19, 2018. ^ Giardina, Carolyn (January 10, 2017). "'Rogue One' Leads Visual Effects Society Feature Competition With 7 Nominations As 'Doctor Strange,' 'Jungle Book' Grab 6 Each". The Hollywood Reporter. Retrieved January 10, 2017. ^ "2017 Directors Guild of Canada Awards Nominees Announced". Directors Guild of Canada. June 26, 2017. Retrieved June 30, 2017. ^ "2017 Hugo Awards". The Hugo Awards. Retrieved April 5, 2017. ^ Couch, Aaron (March 2, 2017). "'Rogue One,' 'Walking Dead' Lead Saturn Awards Nominations". The Hollywood Reporter. Retrieved March 3, 2017. ^ Macke, Johnni (November 11, 2018). "People's Choice Awards 2018 Winners: The Complete List". E! News. Retrieved November 12, 2018. ^ McNary, Dave (March 15, 2018). "'Black Panther,' 'Walking Dead' Rule Saturn Awards Nominations". Variety. Retrieved March 15, 2018. ^ "2019 Hugo Award & 1944 Retro Hugo Award Finalists". The Hugo Awards. Retrieved April 2, 2019.